is your one stop shop for everything boxing! We are growing and expanding and can serve all your boxing autograph authentication needs. We are in the process of adding even more services and promotions so please check back often to see what we have to offer! When you see the WBC Authentication label, you know you are getting quality! We are the trusted boxing autograph specialists you can trust to take the time and authenticate your item properly, thoroughly, professionally and carefully so you can be assured you received what you paid for in an autograph authentication service. We give you our time and attention on each and every autograph you submit to us. Our Rapid Opinion service is now available, get an opinion on any listing online for a small fee and we will let you know our opinion on its authenticity. Rapid opinion fee can be put to a full authentication when you upgrade item to a full certificate. Email us at troste@mchsi.com for more info. and we will be glad to help you out. that no one else has! Boxing autograph specialist Travis Roste and top Ali expert Shawn Anderson are exclusive to WBC Authentication. You can't find them anywhere else. They have the most experience in boxing for any service out there, bar none! Decades of boxing-only experience make them stand out among authenticators. When deciding on which authentication service to use, ask yourself if you would like the top specialists on boxing autographs, and if you would like to them to give each autograph you submit individual attention at the highest level, if you answered in the affirmative to these questions, then you have come to the right place. 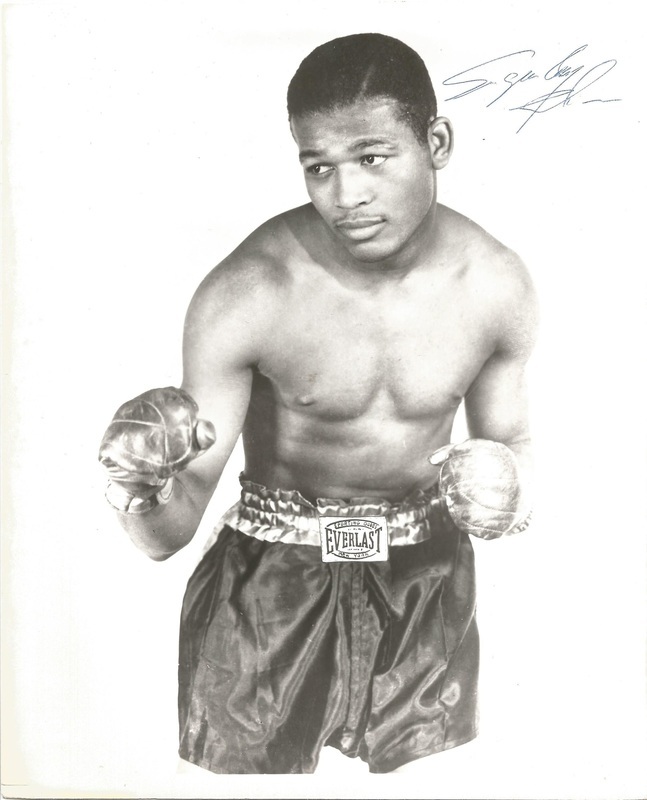 This fine Sugar Ray Robinson was authenticated by our service. We know all the nuances and signing styles for all the legends! The owner insisted on WBC Authentication for this piece and wouldn't consider anyone else. We are a worldwide known boxing brand. and we also know a lot of the boxing insiders for you! If an item is signed by a certain champion, Travis and his team might just call him up and find out from the source just to talk to their friends! At WBC Authentication our friends are an extended family, and we know many people all the way to the top. Why wouldn't we? Our name says it all. We are your leaders in boxing autographs. When using WBC Authentication, you are using a network that is unparalleled in boxing autograph authentication. These champs and more know who is the best and gladly support our leading firm WBC Authentication. If you have any championship belts, trophies, awards, or any championship rings, belts, boxing awards, or any boxing memorabiila, click on the belt above to go to our rings, trophy and awards page and meet our team! We got Ali covered! We are the Ali champs, no contest, hands down. No other service can tout Shawn Anderson as their expert. He knows Muhammad Ali autographs at the highest level. We did this piece for someone who knew we were the go-to guys for Ali autographs! and distinguish ourselves from others by authenticating the right way. We have the specialist who looked at the piece sign the certificate ONLY. The experts listed on our website are the only people allowed to inspect an autograph and sign an LOA, and will only sign off on the autographs they looked at in person. When deciding which company is right for you, protect yourself and ask if only the authenticator who looks at the item in person signs off on the certificate, not on 'behalf' of anyone. We do it right! When you use WBC Authentication, your certificate will be signed by either Travis Roste or Shawn Anderson. They look at all the items in person and they don't cut corners in their authentications.